During the previous LHC runs, the LHCb experiment collected 10 fb-1 and performed many important measurement in the heavy flavour sector. However, many crucial measurements are statistically limited, with experimental precision not directly comparable to the uncertainty of the theoretical predictions. In order to significantly increase the statistical precision on theoretically clean observables in the heavy flavour sector, the level of collected data must be increased much beyond the 1 fb−1 per year. This drives the LHCb detector upgrade that will allow to operate at a constant instantaneous luminosity of 2×1033cm−2 s−1 during a period of ten years, corresponding to about 50 fb−1 of collected data; about ten times the current design luminosity. Opening of the LHCb detector as technicla teams prepare for the LS2 upgrade. To reach the desired performance, all the front-end electronics as well as the detector components with embedded electronics need to be replaced. The current hardware-based trigger will be replaced with a fully software-based trigger, allowing to overcome the current limit of 1 MHz and perform full reconstruction at a rate of 30 MHz to meet the above mentioned requirements. Moreover, to cope with the data flow of 4 TB/s from 2021 onward, the LHCb data acquisition system is being completely renewed. Data will travel from the underground hall via ~9000 three hundred metre-long optical fibres, into the front-end computers located at the surface in a brand new data centre at the Ferney Voltaire site of LHCb. There, ~500 powerful and custom-made PCIe40 boards will receive the data and transfer to the farm containing thousands of processing cores. The LHCb detector will undergo a significant upgrade in parallel to the trigger system upgrade, to meet the renewed experimental challenges due the increased luminosity. Higher granularity and radiation tolerance are key elements to push the performance. The trigger hardware equipment will be removed, namely the Scintillating Pad Detector (SPD), PreShower detector (PS) and first Muon station (M1). Moreover new front-end and readout electronics have been designed for the calorimeter and muon detectors allowing to cope with the substantially higher rates of radiation and will be installed throughout 2019. In the cavern, the LHCb detector halves have just been opened sideways to allow for the temporary beam pipe removal and the start of detector dismantling. The Vertex Locator (VELO), which allows for precise measurement of primary and displaced vertices of short living particles, is one of the detectors that will be upgraded in LS2. The new VELO consists of 26 tracking layers based on 50x50 µm2 pixel technology offering better hit resolution and simpler track reconstruction. Moreover, the new VELO will be installed closer to the beam axis, moving from the current 8.4 mm to 5.1 mm, which means that particles will see more detector material before reaching the first layer of the detector. This poses significant design challenges as the VELO performance is key for determining the resolution on the measurement of the impact parameters of the particles. A new chip, the VELOPIX, was developed and produced for this purpose (read HERE). The new chip collects signal hits from 65,536 pixels (256 x 256) and sends zero suppressed data at the staggering rate of up to 15 Gb/s. Being in vacuum, the dissipated power (about 1 W per chip) must be very efficiently removed. Achieving a temperature of -20 °C at the silicon pixel sensor is absolutely vital, since these sensors will receive the heaviest irradiation of all LHC detectors envisaged so far (including ATLAS and CMS Phase II upgrades) and thermal run-away must be prevented by efficient cooling. A cooling substrate, using cutting-edge silicon technology, was developed for this purpose. An optimized array of microchannels (of just 200 µm width and 120 µm depth) is trenched out of a 260 µm thick silicon wafer by lithographic techniques and then bonded to a mating wafer of 140 µm thick thickness. The Ring Imaging Cherenkov (RICH) detector remains, as before, composed of two systems: RICH1, located between the interaction point and the dipole magnet, and a RICH2 located after the magnet, between the tracking stations and calorimeter system. RICH1 allows one to discriminate kaons from pions in the low momentum range, while RICH2 performs particle identification in the high momentum range. Furthermore, the mirror system, required to deflect and focus the Cherenkov photons onto the photodetector planes will be replaced with new one that has been optimized for the much increased particle densities of the upgrade running conditions. 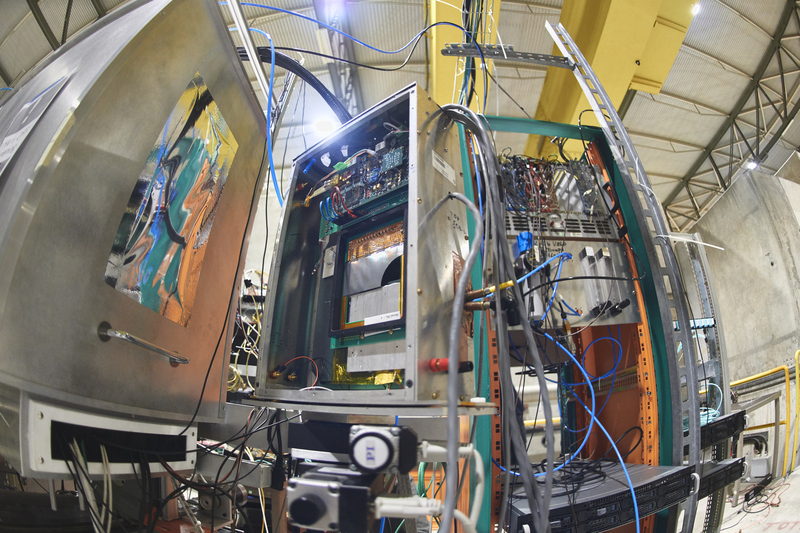 The large mirrors have been produced and are now being coated at CERN. RICH detector columns are composed of 6 photo-detector modules (PDM), each of these containing 4 elementary cells, the basic building block of the RICH detector. The Upstream Tracker (UT), will replace the Tracker Turicensis (TT) mounted just between RICH1 and the start of the dipole magnet. The new detector will play an important role in the High-Level Trigger (HLT) tracking, providing a fast estimate of the momentum of charged particles and allowing rejection of low-momentum tracks, thus speeding up the track reconstruction algorithm by a factor of three compared to the current tracking strategy. Due to its improved acceptance coverage at small angles will also achieve higher trigger efficiency. UT also has finer granularity, improved radiation hardness, and new front-end electronics that will allow a full 40 MHz readout. To counter the effects of irradiation a strong R&D programme was launched in 2014 resulting in a number of new technologies including electronics, connecting cables and an efficient cooling scheme. UT will be contained in a thermal enclosure and cooled to approximately -5 °C using a carbon dioxide evaporative cooling system. Lightweight staves, with a carbon foam back plane and embedded cooling pipe, are "dressed" with flex cables and instrumented with 14 modules, each composed of a polyimid hybrid, a boron nitride stiffener and a 300 µm thick Si sensor. Another formidable challenge for the LHCb collaboration is the SciFi tracker, given the size and complexity of this project, but also because it is the first time that this technology will be used for such a large-area detector and in such a radiation-hard environment. The detector has twelve layers, used for track reconstruction after the magnet region. Following a copious R&D effort in the past year, the detector has been built and is ready to be installed later in 2019. The fibres will be readout by SiPMs placed on the top and on the bottom of the detector layers, reading arrays of 50x50 µm2 sized pixels grouped in arrays of 128 channels and cooled down to -40C. The installation of the LHCb upgraded detector will take place during the LHC Long Shutdown 2. In 2018 the old sub-detectors will be removed, and in 2019 the Upgrade ones will be installed in order to be ready for the LHC Run 3, in 2020-2021. Letter of Intent for the LHCb Upgrade, CERN-LHCC-2011-001 ; Expression of Interest for an LHCb Upgrade, CERN-LHCC-2008-007. Framework TDR for the LHCb Upgrade: Technical Design Report, CERN-LHCC-2012-007.